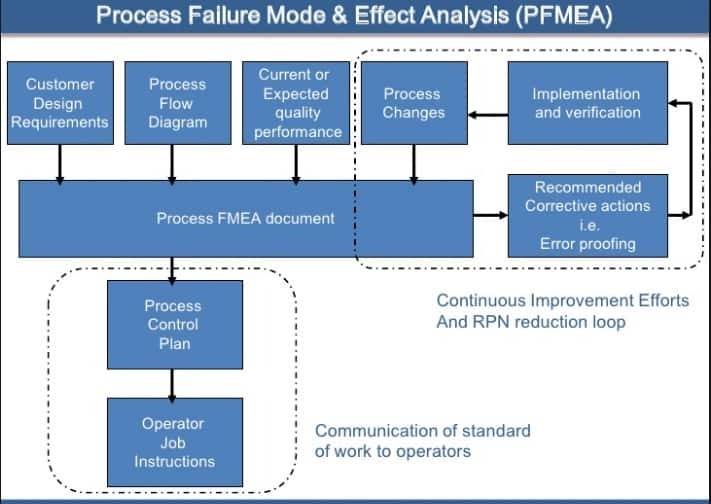 Failure mode and effects analysis (FMEA)—also “failure modes”, plural, in many publications—was one of the first highly structured, systematic techniques for failure analysis. It was developed by reliability engineers in the late 1950s to study problems that might arise from malfunctions of military systems. A FMEA is often the first step of a system reliability study. It involves reviewing as many components, assemblies, and subsystems as possible to identify failure modes, and their causes and effects. For each component, the failure modes and their resulting effects on the rest of the system are recorded in a specific FMEA worksheet. There are numerous variations of such worksheets. A FMEA can be a qualitative analysis, but may be put on a quantitative basis when mathematical failure rate models are combined with a statistical failure mode ratio database. The starting point is not the PFMEA but defining the process in the process flow diagram. Care must be taken here to select the correct wording and level of resolution. The output of process flow diagram must then be synchronised with the input to the PFMEA so that you critique the correct aspects of the process for risk. You now compile your PFMEA in terms of failure modes, effects, severity of effects, causes of failure, prevention controls, occurrence, detection controls and their ranking followed by priority. At this stage it is still important to have recommended actions to reduce risk. However you now need to bring the PFMEA to life through the practical deployment of the content of the PFMEA to production. Primary data being the prevention controls to avoid failure and the detection controls to detect failure at the various stages of the process as defined in the process flow. It is essential that the primary data contained within the PFMEA is displayed at the point of use in plain view to the person who needs to know and act on the data. Failure to do this simple but necessary task will result in a company being exposed to the latent risk of a loss of process control, often resulting in customer complaints. Deployment typically is through the use of visual instructions located where the task takes place, sometimes the data flow is via the control plan (automotive sector), although this does depend of sector specific requirements. Sufficient resolution of the process steps in the process flow diagram. The data contained in the process flow diagram is synchronised to the functional requirements column on the PFMEA. PFMEA is a true reflection of the current situation, as a living document. The prevention and detection controls defined in the PFMEA are communicated to the person carrying out that particular step of the process at the location where the task is undertaken. Appropriate reaction planning is identified at the process step location to clearly identify what to do if a failure is identified.